"It took 10 years for me to get a proper COPD diagnosis"
Hawaiian artist Sean Yoro likes to paint his atmospheric murals on precarious surfaces: melting icebergs, the burnt bark of trees and distant water walls to the benefit of rising tides, among others. The transient nature of the works, which are destined to naturally disappear shortly after their creation, is used to bring attention to environmental problems. But for his latest project, he has set an extraordinary challenge for himself: painting underwater while freediving, a form of diving involving breathing teams and no diving equipment. The project entitled "Deep Seads" is a series of three works created in places around Hawaii designed to raise awareness of dying coral reefs. 1; the only living organism seen from space – can be on its way to a catastrophic future. According to WWF, the coral reefs are home to 25% of all marine life. Yoro used concrete and steel to create inert underwater structures known as artificial reefs used to help jump start marine growth in areas affected of coral bleaching. He transformed them into a canvas for his murals and made sure that all materials used were not harmful to the environment, including the environmentally friendly pigment pins he used to paint. "I had to make my own materials," he said in a telephone interview. "The technique that I ended up using reminded me of charcoal that pulled back when I was in the art school." 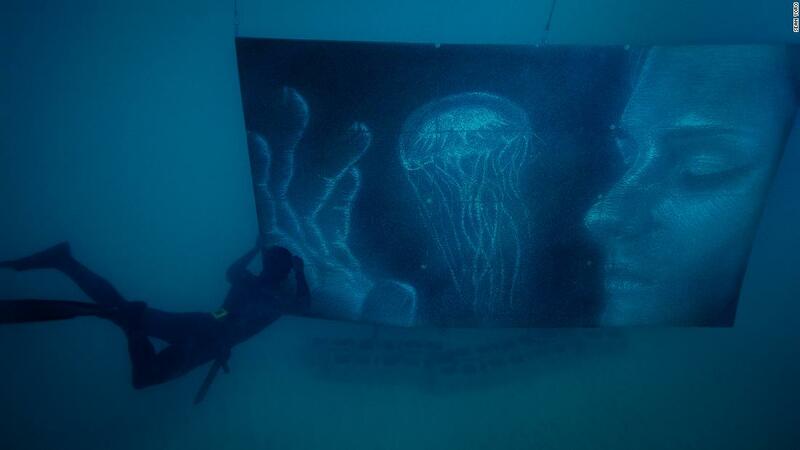 However, the major obstacle was the physical preparation required to effectively paint underwater without oxygen supply. "I've been surfing my whole life, but as much as I have experience in the water, I've never had any experience of diving. So even training on it was much harder than I imagined," he said. The purpose of Yoro was to complete the project in less than six months, but due to extensive training, it required an end to three times as long. "In the first three months it went okay, then I was actually hurt. I blew my eardrum and it took me out of the water for three months, "he said. Even before he got injured, Yoro thought he would be able to keep his breath under water for about. two minutes. "In fact, I could only hold it for enough 40 seconds and go down about 10, maybe 15 feet," he said. After nearly a year of training, his freediving technique allowed him to be immersed for three minutes, giving him about two minutes to paint the time. However, due to the time needed for resuscitation and breathing, he would only come about 20 minutes of the actual painting every hour. This meant that each piece averaged three to four working days with about 10 hours a day in the water. Yoro painted three works for "Deep Seads." The first entitled "Lumens" shows a jellyfish and is intended to capture the moment when he discovered how much beauty and the magic of the sea, as well as the fragile state it is at present. The second, "Breath", an exhale figure, is linked to the discovery of freediving, an activity that Yoro says requires so much control over the lungs as of mind. The third, "Buried" is the image of an eye symbolizing fragility in life that lives in the oceans today. The figure is covered by the sand, which represents the need to protect what is left before it is too late. Like his previous works, these will also be long gone when you read this. Yoro believes that algae began to cover the drawings about 12 to 14 days in, and hopefully many living organisms will now bloom on the artificial reef. Although Yoro often works In remote places and under difficult conditions, he believes that adapting his body to painting underwater has been the most demanding endeavor yet. "By far I would say that this was the most physically and mentally challenging," he said. The seabed, he added, felt almost World War II, which led him to a peculiar mental state. But most importantly, he knew that down there, every move, had to count each stroke. "The most crucial aspect was efficiency," he said. "I had to be very careful about the exact lines so as not to waste any energy. Because I took out with each line, I understood that I was using up oxygen."